San Francisco Mayor Ed Lee came to Paris this past week and met with Paris Mayor Bertrand Delanoë to exchange ideas with innovators and develop stronger ties around the Smart City theme. His trip, cataloged extensively on Twitter, included meeting with representatives from La Gaîté Lyrique, Autolib, and, ultimately, Paris Mayor Bertrand Delanoë. The visit comes just a few months after mayor Delanoë visited San Francisco, during which he met with the likes of Twitter, and set a great tone for 2013 in terms of business connections between Paris & the Silicon Valley. 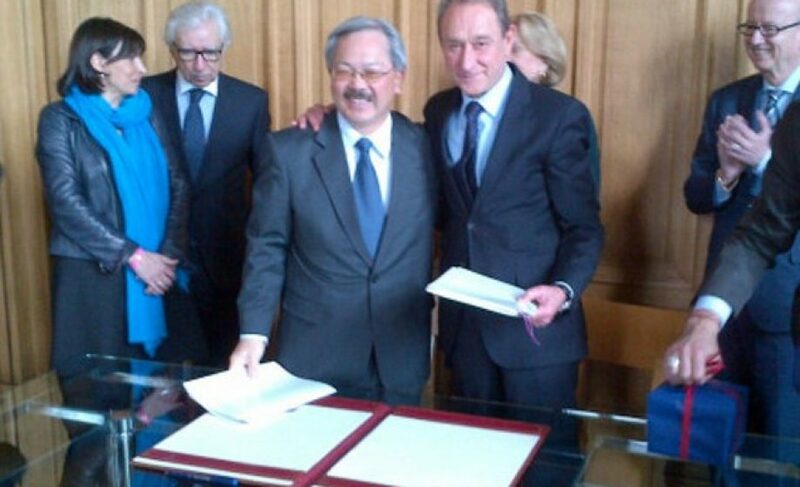 Paris was one of two cities that Ed Lee visited (the other being Cork, Ireland on St. Patrick’s Day). Bonjour from France! In Paris exchanging ideas w innovators, taking note of technology that can drive our economy. SF is Paris of the West! The theme of his trip seemed to be to learn about Paris’ implementation of smart city concepts, including university facilities converting into housing facilities, Paris’ all-electric car-sharing system which, according to Ed Lee, is growing at 15% per month. The trip was coordinated with participation from well-known Silicon Valley investor Ron Conway, as well as well-known Cap Digital President & Fabernovel founder Stéphane Distinguin, who works both in SF & Paris. At the end of his trip, the Paris mayor’s office announced that Paris & San Francisco will be working together to progress the two cities’ digital savvy, which concretely includes working with & supporting France’s INRIA and UC Berkeley’s CITRIS in a joint program around the theme. Paris may be a long way from being the first place tech startups think of when they consider opening an office in Europe, but it’s good to see the two cities’ mayors working today. Mayor Ed Lee called San Francisco the “Paris of the West” – Perhaps Paris may still become the San Francisco of Europe. Paris has loads of world class talents and ideas but needs to market itself internationally much more aggressively than what it has done so far. hmmm – i suppose the real question is can the 2 mayors create an attitude shift in Paris. Remind me to let the people in SF to know that Nice / Cote D’Azure is a stop they should never miss when visiting France. Ohhh wait, if they want cold weather and rain, well they might fell more at home in Paris.